For casual players, simple online blackjack tips can help you reduce the house edge and improve your long-term winnings. Blackjack can be played online in dozens of variations these days, and with a much wider range of stakes than you'll find in a land-based casino in Canada. While players have more games at their fingertips, it also means you need to be armed with a few basic tips before you play. There are many professional blackjack players who have written books about the intricacies of the game, from employing betting systems to card counting. For the majority of blackjack players, however, all you need is a graps of the different bets and knowing when to commit your dollars. 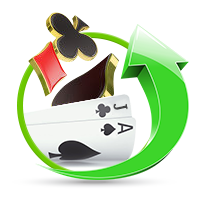 Practice makes perfect," is an old saying that can be perfectly applied to online blackjack. The beauty of online gambling is that you can try new games out for free without risking a cent. There's no embarrassment in sitting at a live table, risking real cash, and learning the hard way; online, you can try out big bets, small bets, or a wild staking system, or try your luck at a crazy variant. Then, when you're ready, get out the credit card and deposit some loonies. Have a go on our free blackjack page, or check out one of the recommended casinos where you can try out games for play money. 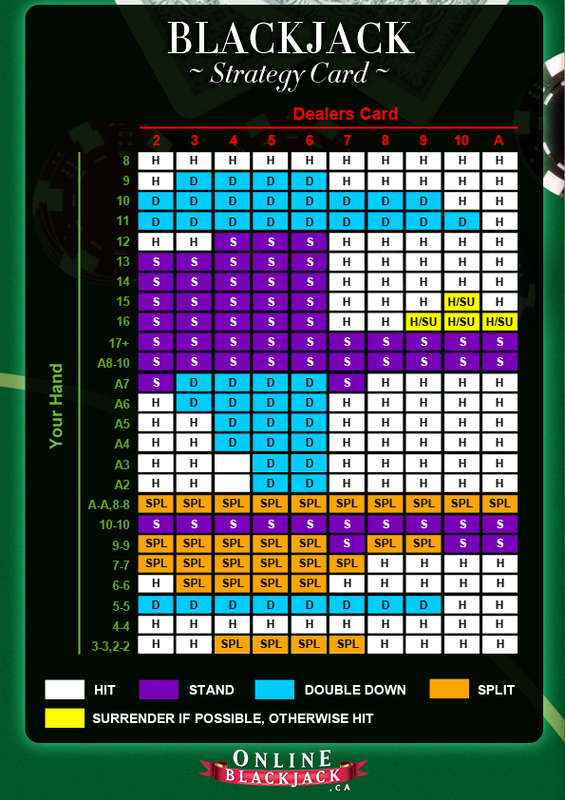 When you're starting out as a new player, learn to use the casino's 'autoplay' mode to help you (the computer will do all the work for you) or click on the Help section where you can brush up on the rules and table layout. Once you've learned the rules, you need to manage your bankroll properly. Other than a blackjack, which pays 3/2 if dealt at the start of a hand, a winning hand pays 1/1 (even money). This can help you plan your bets easily. Only risk 5% of your bankroll per hand and never deviate. So, if you have CAD100, find a table that lets you bet CAD5 per hand. Similarly, if you only have 10 bucks, find a table where you can bet 50c a time. You won't have trouble online; every good casino offers games that are perfect for casual players. Playing blackjack isn't rocket science: you're dealt two cards, and you have to make a decision: hit (take more cards) or stand (take no more cards). Your decision is always based on your cards but also on the dealer's up-card (the one card the dealer shows at the start). So, if you have a total of 4 or 8, and the dealer has a low card, always hit. A dealer will have to hit twice in most cases here and has a risk of busting. You don't need to take that risk, so aim for a 14 or 18 (as in this case), then stand. Conversely, if you have a relatively high hand, say 13-16, and the dealer is showing a picture card, keep hitting. You don't want to stand, then lose to a blackjack or 20 when the dealer pulls an ace or king out of the deck. Hit and aim for 21; it's worth the risk. Check the rules before you begin: some tables require a dealer to always hit on a soft 16, that is, a hand with an Ace in that totals 16. Other tables are different and that can drastically change the dynamics of the game. If you're dealt 10 or 11, always double down. It will be expected of you in a live casino environment, when other players are allowed to bet on your hand too, so don't disappoint. Doubling down involves making a second bet on your hand to receive one more card, and one card only. It's a good move to get to 20 or 21, especially if the dealer is showing a low card from 2-6, which puts him in danger of hitting to a bust. Blackjack on the web is fun, fast and profitable. Master the basics and then move on to exciting variants like Multi-Hand Blackjack or Surrender that you can only find on the web. Plus, blackjack can often contribute towards generous welcome bonuses when you sign up. Make a CAD deposit, play as much blackjack as you can, then watch as the free casino cash comes rolling in. A good first tip for all online blackjack players is to memorise the basic strategy chart for hitting, standing, doubling, and splitting. You'll find one easily on the Internet. Print off a cheat sheet and keep it handy by the keyboard the next time you play. Cheat sheets are great for helping you make the right decision depending on both your cards, the up-card of the dealer, and the number of decks being used in the game. “Insurance bets are offered by most online blackjack games, but don't be tempted. You're better off trying for the 3/2 paid on your own blackjack. Insurance bets are offered by most online blackjack games, but don't be tempted. You're better off trying for the 3/2 paid on your own blackjack rather than the even-money (1/1) odds on the dealer having a blackjack. Plus, hunt out games where the dealer stands on 17. When a dealer hits a soft 17 it gives the house an increased edge. Variation is an important part of any blackjack game so many pros advise to vary betting amounts according to your results. So, if you are winning increase the amount you are betting, and decrease it if losing. Adjusting stakes will lead to a healthier bankroll over the long term. Don't bother with card counting or other tracking systems, particularly online. It's very hard to master, and in any case land-based casinos are very adept at spotting card counters, and even very good ones can be ejected and banned for life. Plus, your face will be sent round every other casino and you'll be barred from those too. OK, so splitting cards means a second bet, and if you're on a tight bankroll that can soon eat into your chips. But splitting gives you two chances to beat the dealer and you need every chance you can get. Seize the initiative and watch your profits grow. Want to improve your game further? Have a look at our blackjack strategy guide to learn more.